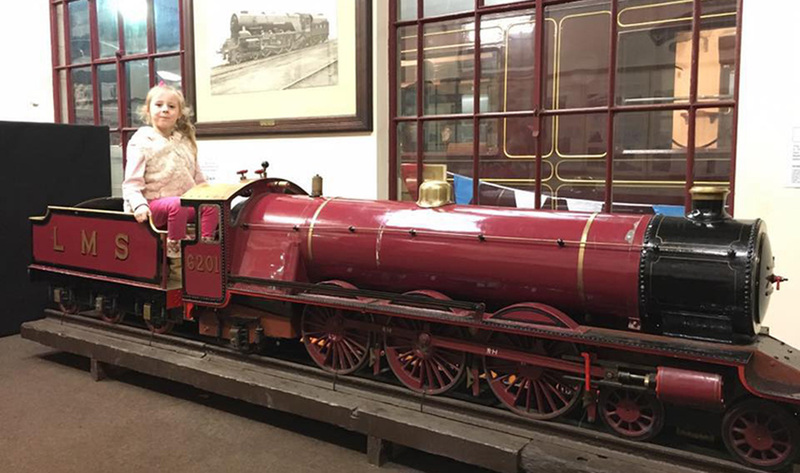 Visit the Trust's West Shed Museum at the Midland Railway-Butterley to view our collection of iconic steam locomotives and historic railway coaches along with displays, films and a viewing gallery above our locomotive workshop. - Two powerful 1930s steam locomotives designed for and operated by the LMS - 6233 'Duchess of Sutherland' and 6203 'Princess Margaret Rose'. - The LMS no. 1 Dynamometer Car - an important locomotive testing vehicle which was based in Derby and used by the 'Testing & Performance' department Engineers. - Another star item in our collection is a 1920s Royal Saloon believed to have been used by Winston Churchill in the days leading up to 'D-Day', 1944. Our locomotive workshop is used for restoration and maintenance work on vehicles in our collection, but is also hired out for use by modern railway companies to carry out work - continuing the link with Derbyshire's engineering heritage. The West Shed Museum is located on the Swanwick Junction site of the Midland Railway-Butterley. Access to the West Shed is via heritage train from the Midland Railway's Butterley Station, alighting at Swanwick Station to walk up to us. When trains are not running, please go to Butterley Station for details on alternative access. The West Shed Museum is open daily 11am - 4pm (except for limited December/ January opening - please contact us for details). Free admission to the West Shed Museum.